Models: TE- wide panes , TD- all wood, milled , DF- plain panels , ZE- narrow panes. Finish: varnished , stained and varnished , white painted , white stained and varnished. You are welcome to browse our price list and assembly instruction. More information regarding e-shopping is available at help. Model TE - yellow glazing. Wooden folding doors with three rows of yellow panes. Made of knagless pine wood finished with of clear varnish. Model TE - clear glazing. 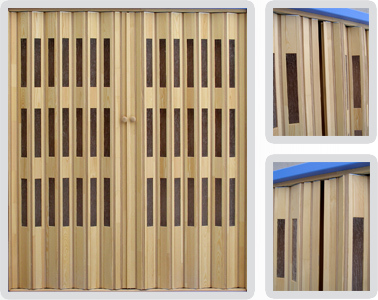 Wooden folding door with three rows of clear panes. Made of knagless pine wood finished with of clear varnish. The whole wooden folding door , no glass panes. Made of knagless pine wood finished with two coats of clear varnish. Door has plain panels, no glazing. Made of veneered pine wood finished with two coats of clear varnish. Natural pine veneer gives uniform and elegant look. Wooden folding doors, varnished with narrow, yellow panes. Natural pine wood, panes of safe polystyrene glass. Model ZE ­ narrow, clear panes. Wooden folding doors, varnished with narrow, clear panes. Natural pine wood, panes of safe polystyrene glass. Wooden folding doors with three rows of yellow panes. Made of knagless pine wood stained and finished with of clear varnish. Various colours available. Wooden folding doors with three rows of clear panes. Made of knagless pine wood stained and finished with of clear varnish. Various colours available. The whole wooden folding door, no glass panes. Made of knagless pine wood hand stained then finished with of clear varnish. Various colours available. Door has plain panels, no glazing. Made of veneered pine wood stained then finished with two coats of clear varnish. Natural grain of wood clearly visible, various colors available. Wooden folding doors, varnished with narrow, yellow panes. Natural pine wood, panes of safe polystyrene glass. Each segment is stained with woodstain then finished with two coats of clear varnish. Model ZE - narrow, clear panes. Wooden folding doors, stained with narrow, colourless panes. ZE model presents modern design. Made of knagless pine wood. Wooden folding doors, white color with clear panes. TE model provides a classic look matching most of the interiors. Made of knagless pine wood. The whole wooden white folding doors are varnished and have no glass panes. We have used the milled wooden panels instead. Doors are made of pine knotless wood. Door has plain panels, no glazing. Made of veneered pine wood, finished with two coats of white, acrylic, semi-matte paint. Door has plain panels, no glazing. Made of veneered pine wood finished by hand with white stain and two coats of clear varnish. This method highlights natural wood grain and makes it visible on white background. We meet the various needs of our customers. For individual solutions please contact us sale@klaczak.com.pl.